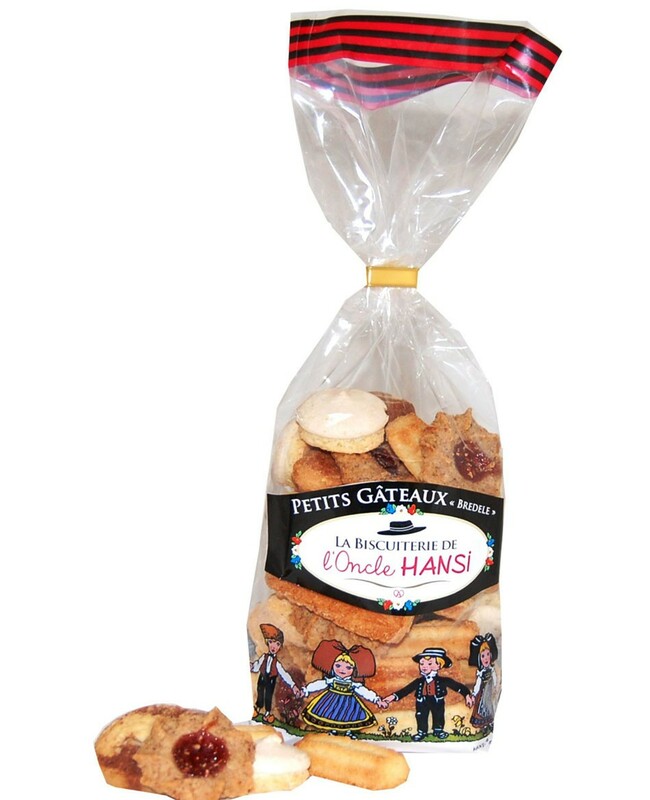 Aniseed biscuits - Small biscuits with green anise seeds : sugar, wheat flour (gluten), eggs, green anise seeds 1.8%. Almond spritz - Shortbread with butter and almonds : Wheat flour, butter 17.4% (milk), sugar, almonds 14%, eggs, raising agent : disodium diphosphate, sodium hydrogen carbonate. Cocoa marbled shortbread biscuits - Shortbread with butter and cocoa : wheat flour, sugar, butter 22.4% (milk), eggs, cocoa powder 1.7%, vanilla flavouring, raising agent : disodium diphosphate, sodium hydrogen carbonate. Raspberry-filled spritz - Shortbread with raspberry filling : wheat flour, raspberry seed filling 26% (sugar, raspberries 9.1%, apples, gelling agent: pectin; acidity regulators: E330, E331; flavouring, preservative: E202), butter (milk), sugar, almonds, water, vanilla flavouring, raising agent : disodium diphosphate, sodium hydrogen carbonate ; salt. Gluten, eggs, milk, almonds. May contain traces of eggs, milk, lupin, soya, sesame seeds, peanuts and other nuts.